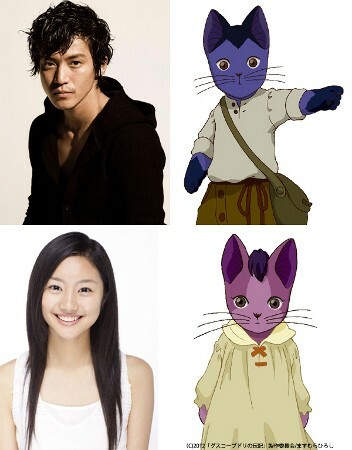 Oguri Shun & Kutsuna Shiori to voice act for anime film "Gusuko Budori no Denki"
Oguri Shun will voice act for upcoming anime film, "Gusuko Budori no Denki". �Oguri will play the voice of the protagonist, "Gusuko Budori" and actress Kutsuna Shiori has been chosen to play the voice of "Neri", the younger sister of Budori. "Gusuko Budori no Denki" is based on Miyazawa Kenji's fairy tale, and it tells the story of "Budori", a son of a woodcutter, who lived peacefully with his parents and younger sister, "Neri" in the forest. �However, "Budori" becomes all alone after a cold-weather front hits the forest. �Even so, he never loses hope, and keeps searching for his younger sister. �The anime film will be directed and scripted by Sugii Gizaburo, who also directed anime film "Ginga Tetsudou no Yoru (Night on the Galactic Railroad)" in 1985, and he will also take part for the storyboard. Oguri stated that he loves the original book which has a richness of Japanese language, and commented, "Since my character has very strong thoughts, I hope that I will be able to express his honestness and sincerity with my voice tone." �Kutsuna also commented, "This is my first time to voice act, so I was quite nervous, but it was also a fun experience." "Gusuko Budori no Denki" is set for release on July 7th. Sawashiro Miyuki, Kawasumi Ayako, and Nakahara Mai to join as voice actresses for "AKB0048"